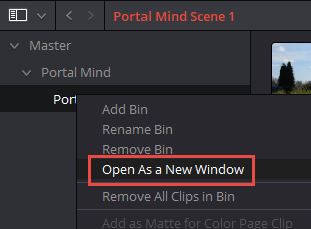 Now that I have my ‘Bin Structure’ created with the clips added to my project (you didn’t actually move clips, you just added links to those clips to your project) the highlighted button opens/shuts the side panel to give you move room if needed. The controls shown above to the top right of the Bin panel give you additional options. The slider zooms thumbnails and the little up/down arrow next to the slider allows for filtering of your clips based on different parameters such as file name or starting time code etc. Next to that is the option to see thumbnails (icons) or to work with a list view which gives additional information about the clips (called metadata) and then a really interesting option which allows you to have 2 Bin panels open at the same time – either side-by-side or top-over-bottom. However, while it looks like you only have the option for 2 panels, in reality you can have as many as you like simply by right-clicking on any bin and looking for the following option. This gives you a floating window of that Bin to use as you like. The remaining two buttons after the split view button allows you firstly to search for items and lastly, the three dots only work with list view as this shows a ‘flimstrip’ view of the selected clip. Now that your clips are in the project you soon realise that often the names of the clips themselves aren’t exactly what you want. 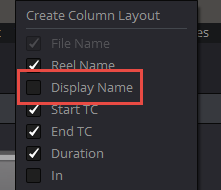 So, Resolve has a simple solution for you to add a working or ‘Display Name’ to your clips. This can be done in a number of ways but the quickest way is to work in ‘list view’ so you can see all the metadata for your clips. Now, right-click on the header part – say over the word ‘File Name’ – and you get an option to add or remove items that can be displayed. The third down is ‘Display Name’. Make sure this is ticked and ‘Display Name’ is added to the list view so you can quickly add a descriptive name for each clip. HOWEVER – as yet you won’t be able to see these ‘Display Names’ until you turn them on. This is done through the ‘View’ menu. Once this is checked, Display names will be visible throughout the project although to see them in the ‘Color Page’ you will probably have to double-click the text below the clips to toggle between Codec, Display Name and Versions).